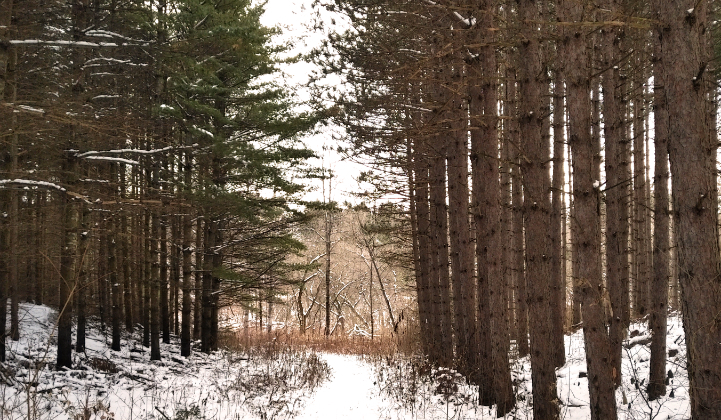 TRCA Staff have recently completed a Trail Plan for the Goodwood Resource Management Tract (Goodwood RMT), in partnership with Green Durham Association, Parks Canada, and the Oak Ridges Trail Association. This new Trail Plan will further the sustainable public enjoyment of the Goodwood RMT and endeavor to create a sense of arrival and entrance to Rouge National Urban Park (RNUP). The Goodwood RMT Trail Plan was approved by the TRCA Board of Directors on November 30, 2018 (Resolution #A184/18) (the board report can be accessed here). The approved Trail Plan can be viewed here. Help TRCA provide you with the best possible trail experience by completing the Goodwood RMT Trail User Survey. The public engagement process for the Goodwood RMT Trail Plan has ended. The archived public engagement page can be accessed here. The Goodwood RMT is a 315-acre property located near Webb Road and Concession Road 3 in the Township of Uxbridge. The property is surrounded by forested areas and agricultural fields, and is located just north of the RNUP. A section of the main Oak Ridges Trail runs through the property.